I know that the idea of a "capsule" collection is nothing new - well, I learnt that on Wikipedia after I first stumbled upon a blog post about a "capsule wardrobe" and had no clue what the heck it meant - but I think there's a renewed interest for this concept in the blogosphere. And yes, I've been infected by the capsule mania, apparently! The thing is that this idea is both brilliant and incredibly simple, and although it's usually a fashion-related term, it's very inspiring when transposed to makeup. So, in a few words: a "capsule collection" is a limited selection of items that work well together and are interchangeable, so you can easily create a variety of looks with a small number of pieces. Obviously it works well for clothes, but it's also a great way to make the best of a large makeup stash. Let me explain: having too many options is not always good, and psychologists have actually theorized that it causes anxiety. Opening a drawer full of lipsticks and having to pick one among a hundred is more confusing than truly enjoyable. 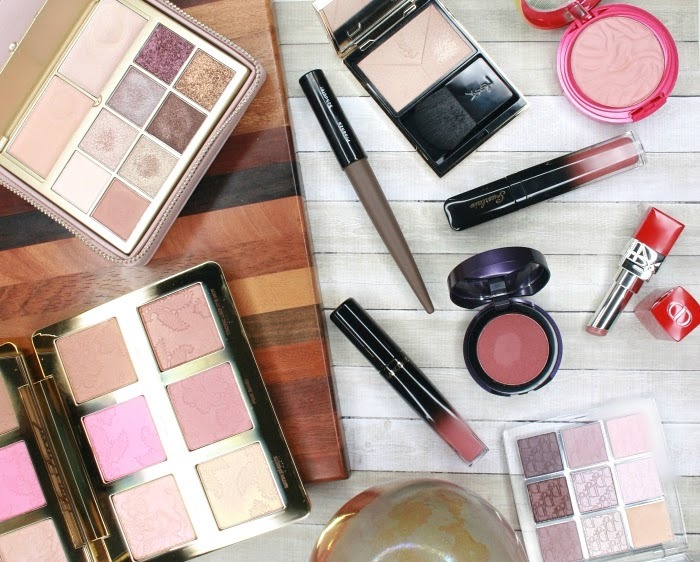 This is where pre-selecting a small number of makeup products, based on a theme, color scheme, or whatever makes sense for you, can turn the difficult process of choosing what you're going to pair with what into an easy decision. Yes, I'm very aware that this is an answer to a crazy-makeup-lady first world problem, and I can see some of you rolling your eyes in the back. 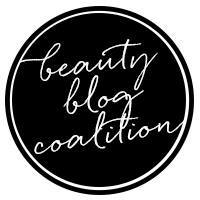 But if, like me, you have these disturbing feelings of guilt for owning a lot of makeup and only using about 10% of it regularly, the capsule idea can re-inject some fun into your beauty routine and help you rediscover products you had forgotten about, simply because they were never in your regular rotation. I decided to apply the "capsule" idea when selecting the makeup I took with me on my recent trip, so let me introduce you to my first ever Thanksgiving Makeup Capsule! You might wonder how that's any different from picking some stuff and throwing it in a makeup bag as I usually do: remember, the key to the capsule concept is that everything is interchangeable. In other word, any item selected MUST work with any other one! 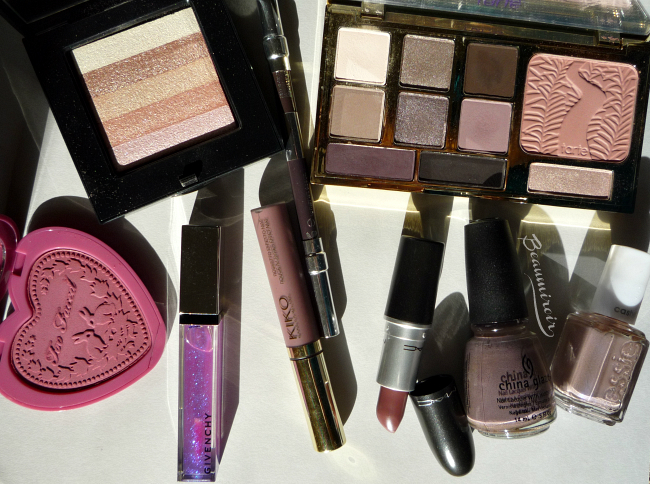 So any lipstick I chose had to pair well with any eyeshadow or blush I had already picked. When I pack for a trip, I usually take some neutral, day-time eye makeup, a couple different blushes, my favorite lipsticks of the season and a few more dramatic pieces to wear for a night out - but not all the products will work well together, and I've found myself in trouble a few times, realizing away from home that what I picked in a hurry didn't coordinate well. In this capsule case, however, because everything pairs well with everything else, creating a balanced, polished look is easy and there isn't much guess work involved. As a result, I also packed fewer products than usual: no overflowing makeup bag this time! Here's how I created my capsule: I decided that for Thanksgiving I wanted to wear some purple and neutrals. I opened all my drawers and went through my makeup collection, looking for products that matched the description. I set them aside, and made sure that everything I selected would work together well - at that stage, I excluded a few products that had very warm undertones. Then I threw everything in my Maleficient makeup bag, and added my basics (foundation, powder, concealer, mascara, primer...). Done. The process was fun because it allowed me to dig into my stash looking for anything that would fit the theme. I rediscovered products I had forgotten about, picked a few I hadn't worn in over a year, and getting to use these neglected items again made me feel good! In fact, I think that creating makeup capsules could help me buy less shiny new makeup and focus on the products I already own. - Bobbi Brown Shimmer Brick in Pink Oyster: hadn't worn it in over a year! I read it was an Asia exclusive, but I found mine in a duty-free shop a few years ago. Anyways, this is a hard-to-find shade of Bobbi Brown's cult highlighter, a pale, almost white pink, very delicate and even more beautiful than I remembered. 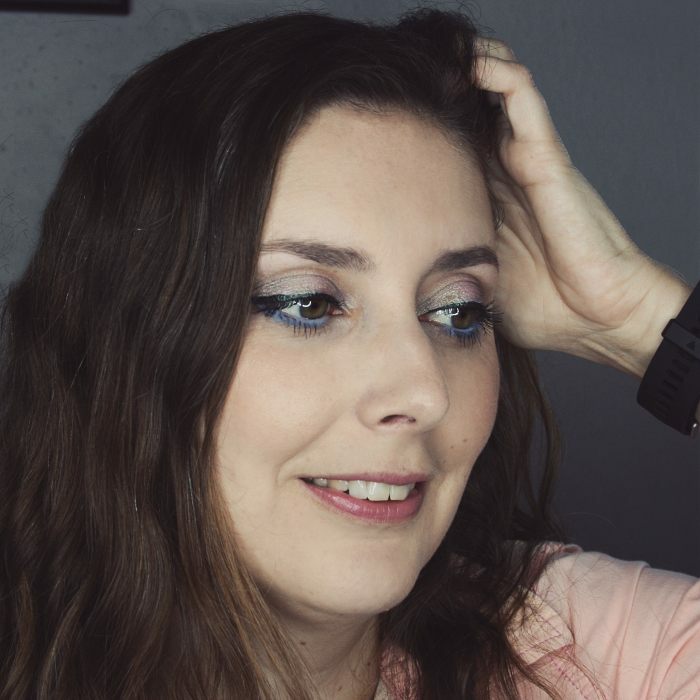 - Kiko Double Glam Eyeliner, a matte brown and a purple with very faint shimmer: I love Kiko's eyeliners, and this one is great to line the upper lash line or smudged as a base for a smoky look. This particular shade was a limited edition from a few years back, but Kiko has made new ones for their 2015 Holiday collection. - Tarte Energy Noir palette: like I said in my recent review, I was a bit disappointed by the quality of the shadows in this palette, but it fit the purple/neutrals theme perfectly. I haven't changed my mind, the shadows are either not very pigmented or hard to blend, but I managed to make it work well enough on top of a good primer (Too Faced Shadow Insurance). - Too Faced Love Flush Blush in Your Love is King: I told you earlier this month how much I love these new Too Faced blushes! This shade is a flattering plum that leans warmer than the rest of the Capsule products, but still pairs well with them. - Givenchy Gelée d'Interdit Smoothing Gloss Balm Crystal Shine in Electric Purple: phew that was a long name... I'm a sucker for anything with blue sparkles, that's why I bought this gloss a few years ago, but I only wore it a handful of times since. It's basically clear with purplish blue sparkles that reflect the light, it's pretty to wear by itself for an understated but eye-catching look, and it also works well layered over lipstick for extra shine. - Kiko Ultra Mat Light Lipstick in Rose Mauve: this is an old limited edition matte liquid lipstick I had completely forgotten about... It might not be as comfortable as some of the most recent liquid matte lipsticks, but it looks really good on and I'm thrilled I re-discovered it! Turns out I have it in 2 other shades too, lol! - MAC Hot Chocolate Lipstick: another one I had totally forgotten about, and boy am I glad I found it! This is a killer shade for fall/winter, a sultry plummy brown that lasts really well and is very comfortable. I actually reviewed it almost 3 years ago. - I also picked two nail polishes, China Glaze Below Deck and Essie Comfy in Cashmere. The first is a muted mauve, the second a beige with subtle blue shimmer and a matte finish. I ended up not painting my nails during the trip - yeah I'm lazy - but they both fit the color scheme really well. Just as planned, everything worked well together and I was able to create a variety of day-time and party looks very easily. This was a very successful first "capsule" creation experience for me, and I really enjoyed it. A fashion capsule wardrobe is usually meant to last for a whole season, but in order to rotate through my makeup stash faster and allow more frequent mood changes, I'm thinking to do monthly or maybe even weekly capsules. Did you know about the capsule concept? 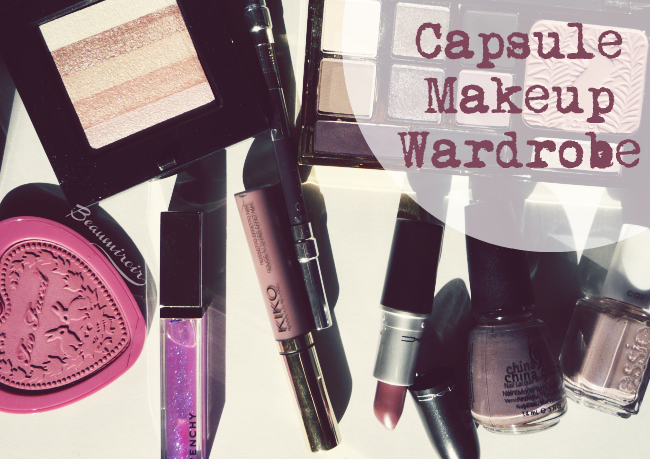 Have you ever done a capsule wardrobe or makeup collection yourself? What do you think of the idea? The products featured in this review were purchased by Lulle. I received no compensation to write this post, which only reflects my personal opinion. This post contains affiliate links.